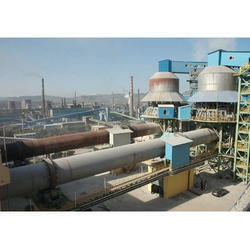 Providing you the best range of quick lime calcination plant with effective & timely delivery. In calcination process, lime is cooked/calcined at 800°c in a kiln. We are providing shafts kilns and rotary kilns for calcining of limestone/lime sludge with multi fuel options. Prior to calcination, exhaust gases of kiln preheat lime. And after coming out of calcination area, quicklime is cooled by direct contact with cooling air. Limestone calcination process is selected on basis of limestone. If size of limestone is less than 4 inches and capacity of plant is less than 200 tonnes per day, then shaft kiln is selected. Whereas for higher capacities and for small stone size sludges (industrial waste), rotary kiln is installed. Looking for Quick Lime Calcination Plant ?